Third day of screenings at Sardinia Film Festival. The screenings of the last day of Villanova Monteleone Award for the Best Italian Documentary started at 5,00 pm at Su Palattu e ‘sas iscolas. The first shortfilm was “Cent’anni di corsa” by Domenico Perrino, a true story based on Giuseppe Ottaviani’s life, a 100-years-old-athlete that developed his own philosophy from running. Later, Luciano Accomando’s “Pictures from life” has been screened. This is a moving project which analyses every aspect of immigration, from the anxiety and fear of the immigrants who never saw the sea before taking a boat to Italy, to the social hardship that they live once they arrive, they are marginalised from a society who kills the hopes of the people who takes a hard trip to find a better life. The documentary faces many sides of immigration, starting from the working condition to the complexity in integration and also arts and sport. Among all the experiences, there’s a moving sentence in the film : “I hate when Italians say: I’m not a racist, but.. because in all those “but” shoah is included, in all those “but” there are the biggest known tragedies”. Then, it was the turn of “Sardinia in a day” by Fabrizio Piras, Remo Scano and Gabriele Peru which has been warmly received. It’s a documentary about Sardinia that is told by its inhabitants who actively took part to the project sending shreds of their life to the filmmakers. To follow, the “Devil street band”started an itinerant concert which ended in Piazza Piero Arru with the last screenings. The night had Cecilia Mangini and Gesuino (known as Gino) Pireddu as the main guests. Pireddu was one of the boxers who has been interviewed in 1969 into her doc “Ring Sardegna“. 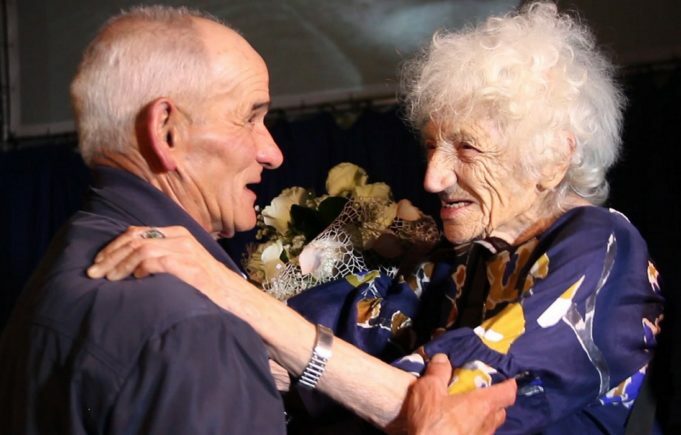 The director was unaware of Pireddu’s presence and got very emotional when she met him onstage, after more than 50 years that documentary, which has been projected shortly after. Besides Bolotana’s boxer-shepherd, the documentary talks about the dream of social redemption of many men from the South of Italy and many Sardinians too, like Pietrino Langiu, a bricklayer from Ozieri. To follow, the public watched the last film in competition, Marco Bertozzi’s “Cinema grattacielo”. The most famous skyscraper of Rimini is the storyteller of the changes which completely transformed the city, starting from the “Italian dream” which accompained its building in the Fifties until these days, that it became a cross-cultural microcosm. 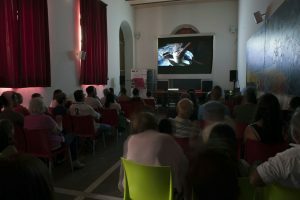 Starting from tonight at 9,00 pm, in the location called Lo Quarter in Alghero there will be the screening of International Fiction shortfilms and next days ther ewill be also unique events like Artur Aristakisyan and Oscar-winner Aleksandr Petrov’s masterclasses. To follow, il SFF will move to Bosa, Stintino and Sassari, the all the awards of this 13th edition will be assigned. There will be two important prizes: the Unipol Sai Award to the best international fiction and SIAE- SILLUMINA Award to the best Italian under 35 author.